Interested in staying in a stylish Victorian building situated in the city centre? 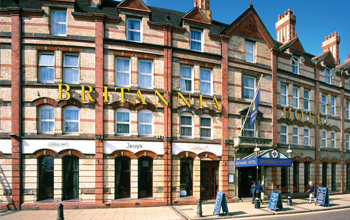 The Britannia Wolverhampton Hotel is a short walk to Wolverhampton University, making it perfect for that special meetup and family reunions. With all the big brands expectable in a city, the Mander Shopping centre is conveniently based just a five minutes' walk to St Georges Metro Station. Wolverhampton's Grand Theatre is just down the road, so is The Light House. A cultural hub with 2 photography galleries, live events programme and arts cinema. Its prime location means that there are an abundance of local restaurants, bars and experiences on offer. Aiming to provide guests with the best stay possible, we also offer free Wi-Fi. To make sure that the whole family can reunite, guests are also welcome to bring their furry companions to this pet friendly hotel.